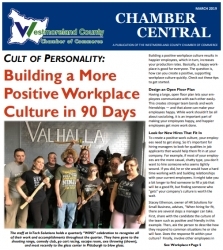 InTech Solutions, Inc. has been featured in the March 2019 Westmoreland Chamber Newsletter for creating a strong workplace culture. Greensburg, PA, March 13, 2019 --(PR.com)-- InTech Solutions, Inc. has been featured in the March 2019 Westmoreland Chamber Newsletter for creating a strong workplace culture. The full article can be read in March’s Issue of The Westmoreland Chamber Newsletter. Leia Shilobod is the CEO of InTech Solutions, a fast-growing IT services firm based in Greensburg, PA and bestselling author of Cyber Warfare: Protecting Your Business From Total Annihilation. As a cyber security advisor, Leia speaks frequently at venues and events such as Harvard Club of Boston, Pennsylvania State Department events, and Accounting and Manufacturing industry events. Also known as the “IT Princess of Power,” Leia saves small and mid-market firms from hackers and keeps them compliant by delivering enterprise-class IT security solutions. Click here to view the list of recent Press Releases from InTech Solutions Inc.